In Ancient China traditionally a Taoist Practitioner is one who does it all: meditations, sacred sexual practices/ art of bedchamber, shamanic healing, and the Martial Arts as the Tai Chi and Qigong (is an internal martial art). This is how Anamarta learned in the modern days, so its just not for ancient goddesses!… It is part of the Tao of Feminine Empowerment. The greatest Meditation in Motion I came across, uniting us in perfect harmony with Earth below and Heaven above, yin and yang, which benefits body, mind, and spirit! 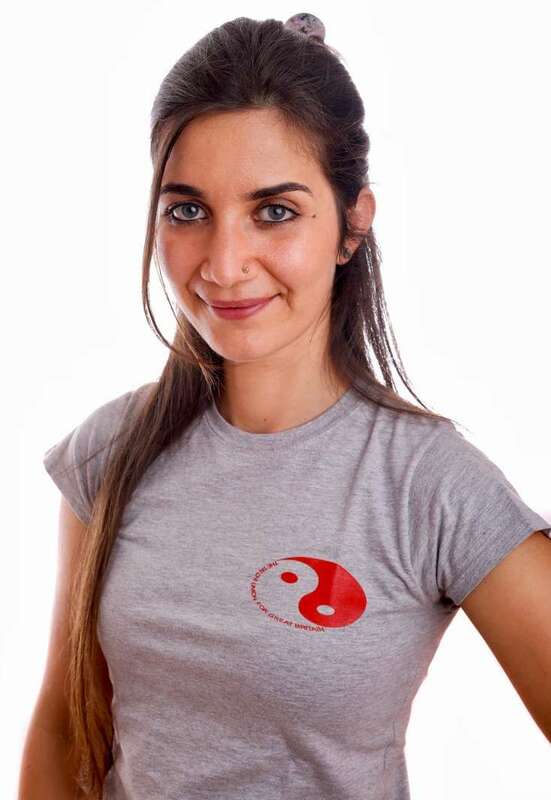 Tai Chi is the essence of Feminine Empowerment, connecting with higher and lower forces on the spiritual path, for self-defense (see Anamarta’s video below) or simply to harmonise with the environment and alleviate the effects of stress. Anamarta shared the Goddesses Do Martial Arts! 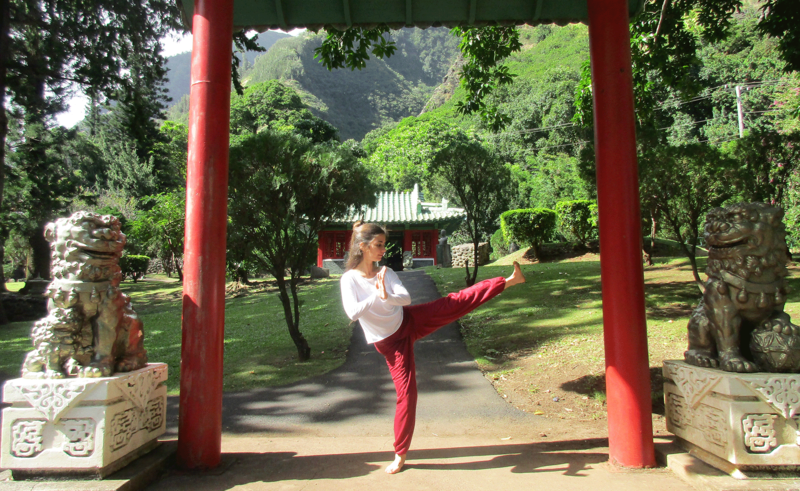 article in which she develops this subject and shares her story: how a self-defence movement of the Tai Chi form she had learned less than six months, when she started her training twelve years ago, saved her from an attacker. 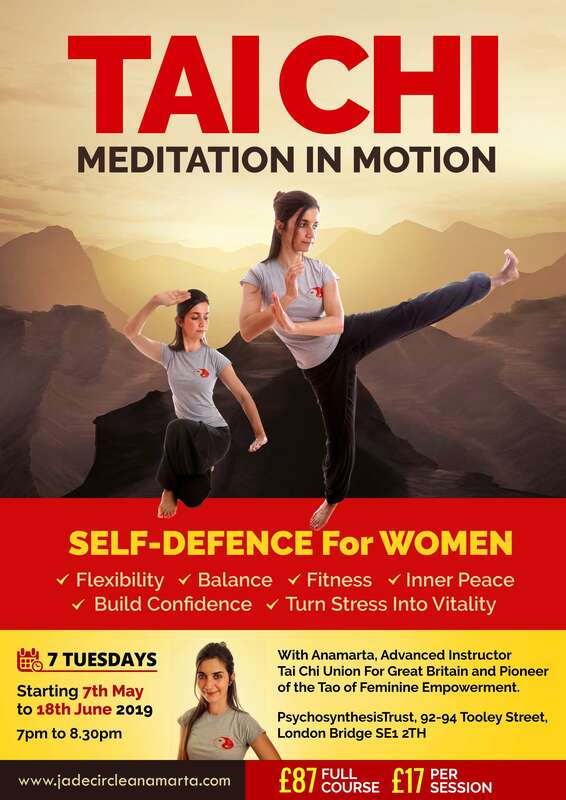 ALL WOMEN are Welcome to Join Us in this Unique Tai Chi Qigong & Self-Defense Course in London, after the success of the first course, here the second edition and last of this year! 7 Tuesdays, 13 Movements, 9 Directions, 5 Elements, 3 Treasures, Yin and Yang, to learn or evolve with our graceful Tai Chi Form, and Benefits which this ancient whole body exercise has in all levels of your being. We practice a short Yang Family form (13-Movement, 4 Directions, Yin and Yang), which evolved from Taoist Master Kris Deva North studies with Grandmaster Mantak Chia’s Tai Chi Qigong, and the Push-Hands from Master Lim of Penang, a student from one of the greatest Tai Chi Masters from the last century, Cheng Man Ching. Anamarta feels honoured to be part of this lineage and deeply grateful to her teachers. And of course to her students too, for the opportunity of sharing this Taoist Art. Scroll Down for the video of this form. *Relaxing the Mind and *Lifting the Mood. *Effective Ways To Manage Stress while at the same time giving a fantastic *Energy Boost! *Connect with the Inner Warrior, while revitalise your whole being! *Train the body and mind how to respond effectively to life’s challenges. Have you noticed that people who do Tai Chi seem to stand straighter yet more relaxed, move more easily with a kind of fluid grace? Have you wondered why and how? Well, above is your answer. But there are More Benefits! Keep scrolling down. In the double-helix spirals of Tai Chi we reunite the Yin and Yang forces of our creation, to ebb and flow throughout our meridian network, feeding the organs that sustain our life. We open and stimulate the meridians, the energy-flow channels, enabling the bio-electro-magnetic force, Qi or Chi, to come on full charge as we do the slow graceful form. 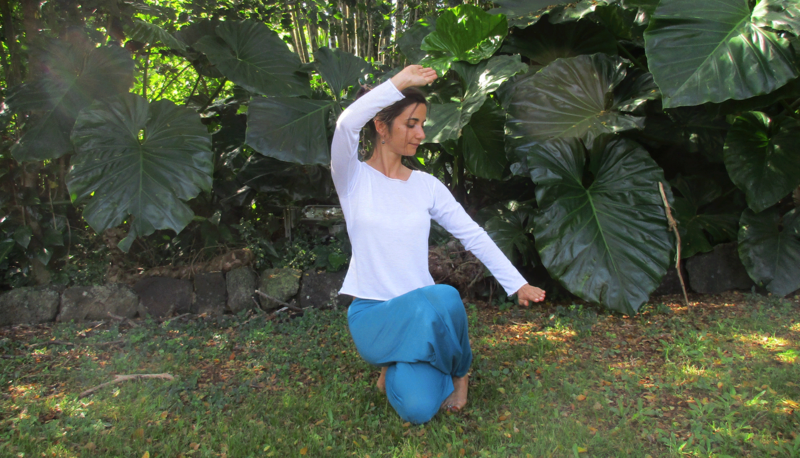 Kuan Yin Qigong Warm Up – besides grounding and centering, offers gentle, but profound exercises for the whole body, including the pelvis. Chi Self-Massage – body wellbeing, and hormonal balance. Eight Pieces of Brocade Qigong – building more power and rooting. Tai Chi Movements and Self-Defence Application. We have a series of 7 Free Videos which covers the Tai Chi movements you learn, on Youtube “Tai Chi by Numbers”. And an Audio mp3 with the Tai Chi Form Step by Step you can buy. Tai Chi & Qigong can be practised at any age, for health, to enhance our protective energy-field (aura), to strengthen our physical and energetic immune system. You can enjoy the saving when signing up for the 7-week course starting on Tuesday 7th May and finishing on 18th June 2019. Or you can pay-as-go, and attend the classes at your convenience. *** Wall Street Journal “Qi can’t be measured objectively, says Shin Lin, a professor of cell biology at the University of California, Irvine. But his studies of qigong and tai chi practitioners have found a boost both in alpha brain waves, suggesting relaxation, and beta waves, indicating strong focus. “It has the dual benefit of relaxing you, but also sharpening your mind,” says Dr. Lin. Discover a spiritual aspect in the graceful spirals of the Tai Chi form. Learn Tai Chi as shamanic theatre, celestial combat, rooted in Earth and played in the human dimension. Yang advances, Yin withdraws, Harmony prevails. Learning the Way of the Hidden Masters gives a sense of reality to this ancient art as we emulate the heroes of then, the warriors, the fighting nuns (and monks), and priestesses. Healers and Martial Artists use Tai Chi & Qigong to improve external Qi-projection and internal rooting. The combination of these supports the steady grounding which keeps them safe and healthy. As you combine the Hidden Masters practice of Tai Chi with the Five Steps of the Jade Egg Training in the Tao of Feminine Empowerment, you learn to integrate the power-techniques of Kuan Yin and Steel Body Qigong, the psychic self-defence of Fusion Mediations and the extra-sensory perception of the Tao of the Shamaness, utilising the Inner Eye to anticipate, disappear and counter. And the rootedness developed by this stage keeps ourselves safe when practising astral projection in the higher meditations. Anamarta had the pleasure to co-facilitate with Kris Deva North various Tai Chi and Qigong Teachers Trainings, having qualified many students and witnessed how Tai Chi is suitable for any age: her youngest student was 11 and the oldest 72 years old. Kuan Yin Qigong Teacher Training– click here for more details. Here’s a glimpse of the martial art application and advanced practice. A few years ago in Hawaii, practicing the form with Kris Deva North.